I read recently that bees are very calm insects, not out to get people, but only sting when threatened. I suppose, hysterically swinging arms feel threatening. Many tend to get a little excited when a bee comes summing, too close for comfort. And why is that? A bee sting hurts. I have had my share. From a painful sting behind my ear as a little girl, stepping on bees - to the night spent as a 5 or 6 year old and I slept in my grandmother's loft, not knowing there was a large beehive there. That night I acquired more than what was good for a little munchkin. I have studied at a university in the Beehive State, love listening to the musician Sting, and had The Sting as one of my favorite movies as a teenager. So, why write about bees? Lately there has been much talk about the extinction effect of bees. Whole colonies of bees and bumblebees collaps and scientists have not been able to figure out why. The import of bumblebees to the US in the 1990 caused two species died out, another is about to. In South America the import of bumblebees to greenhouses have caused problems as the insects escape and cause imbalance and competition as they mate with other local bumblebee species. Bees can also suffer serious effects from toxic chemicals in their environments. Pesticides actually kill them. We are dependant on these little creatures for pollenation. They also make excellent honey, a yummy treat that can be used in so many ways and is wonderful to have in one's food storage supply. Without honey bees, 80% of the plants will disappear. We need certain plants so that butterflies won't extinct. We need fruits and vegetables not to diminish. What can we do? I am not the kind that wave my arms around when bumblebees approach. I plant herbs that I know they love. My herbal patch is enchanted come late summer with bumblebees and butterflies. A beautiful sight and I laugh when I think of how noisy they are, never able to sneak up on anyone. As soon as they move around, they buzz energetically. 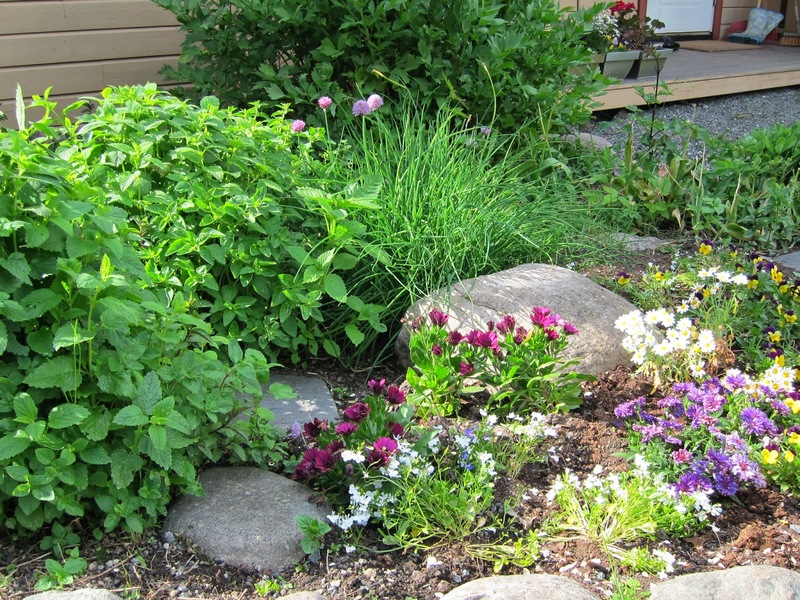 Which herbs and plants should we have in our garden or in planters on the terrasse to attract bees and butterflies? What can we do to help out? There are two things they look for in our garden, nectar and pollen. Nectar is the bees sugar and energy diet, pollen provides them with protein and fats. Borage, Catmint, Chives, Comfrey, Hyssop, Lavender, Sage, Thyme Marjoram/Origanum, Mints, Lemon Balm, Fennel, Angelica, Wild Bergamot, Woundworts, Betony, Myrtle, and Rosemary. Lemon Balm is also used as an insect repellant. Rub some of the leaves on your hands to prevent bee stings. In the past, beekeepers would rub a handful of lemon balm (Melissa officinalis) inside the hive after hiving a new swarm, in order to help the swarm settle and to encourage them not to leave the hive. Rubbing hands with the leaves is also claimed to help prevent bee stings! I have had many of these herbs in my garden and therefore enjoy both butterflies and bees close by. I have notoce that they especially love the peppermint, spearmint and lemon balm. A who does not pick up a dead bee to check it out? Where is that stinger? What does it actually look like? I am as curious as the next person and like to learn. A sleeping bee would be nice, too. Barbra Streisand sings about A sleepin' bee. A love song. But if you appreciate Miss Streisand's wonderful voice and ability to interpret music into stories, you should click on the link listen to it. 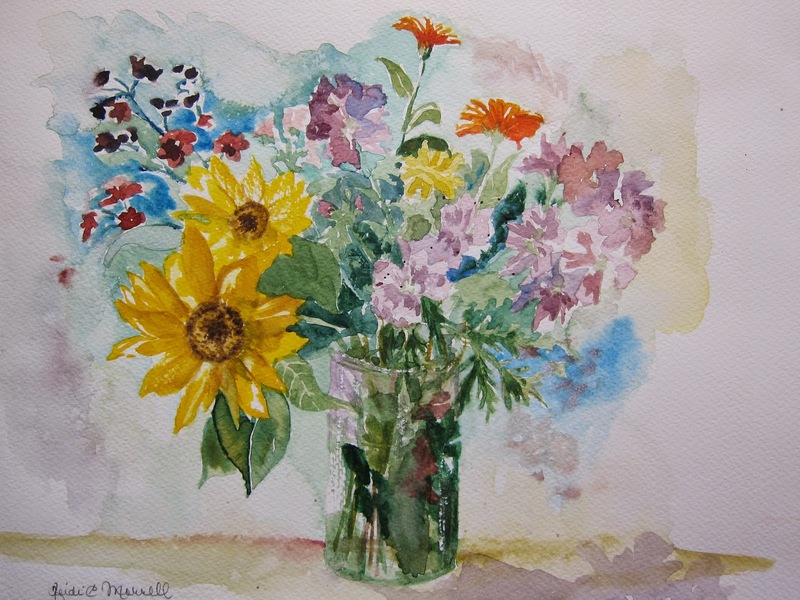 Today's art is a bouquet of flowers from my mother's garden and a photo from my herbal patch at the Duck and Cherry. The three photos of bees and butterflies sitting on the Echinacea purpurea, were taken in Finland on a business trip learning about that wonderful medicinal flower. Viktig det du skriver om her. Vi fikk masse kløver i greset nå når det var så tørt. Det er snadder for bier og humler, så vi har ikke klippet gresset (er ujevnt fordi det er grønne områder, brune områder og områder med kløver) for at humler og bier skal få forsyne seg. Det er en liten ting vi kan gjøre for å hjelpe vår verden. Selv om man bare har balkongkasse kan man jo gjøre noe, men selvfølgelig lettere med hage hvis man er redd for bier. Det var lurt med kløverengen på gressplenen. Det hadde jeg ikke tenkt på.